It’s 2104, it’s a World Cup year so what better way to get in the football spirit than to check out a slightly bizarre online slot with the beautiful game as it’s theme. 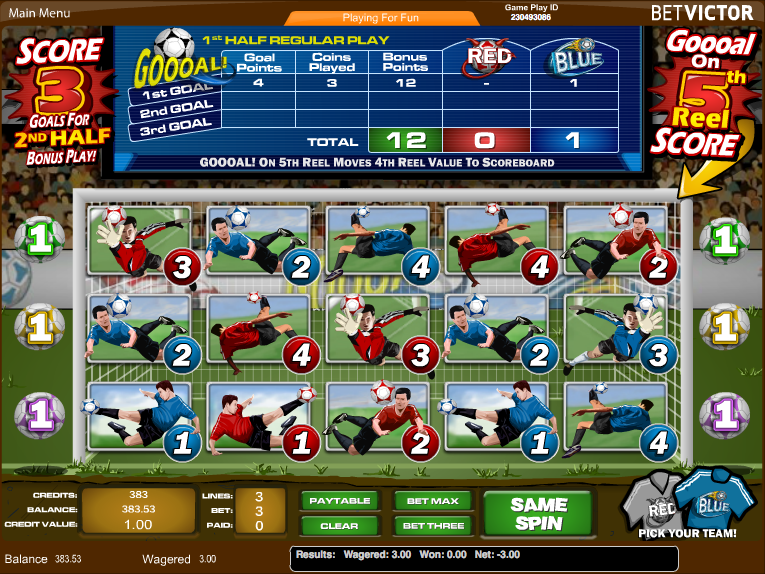 It’s from Amaya Gaming and it’s called Goooal! which is the type of vocal celebration reserved for South American commentators.It’s a little bit involved so read on to find out how it all works. Goooal! plays out over five reels and just three paylines but it’s a lot more complex than that small number of paylines would suggest. Behind the reels there’s a football pitch and stadium just about visible. When you being the game you can pick your team from the red and blue options available. The symbols are a range of players kitted out in red or blue and all are frozen in action poses which they presumably hope will result in a goal. Each has a number between 1 and 4 attached. There are no wild symbols but there is a Goooal! symbol which only appears on reels five and which we shall elaborate on below. Landing the Goooal! symbol on reel five means that the number on the position immediately to it’s left is transferred to the Goal Points box on the table above the reels. That’s the first goal scored and then the second and third goals will fill up the respective boxes. Goals can be scored by the red and blue teams. When three goals have been scored the 2nd half begins. 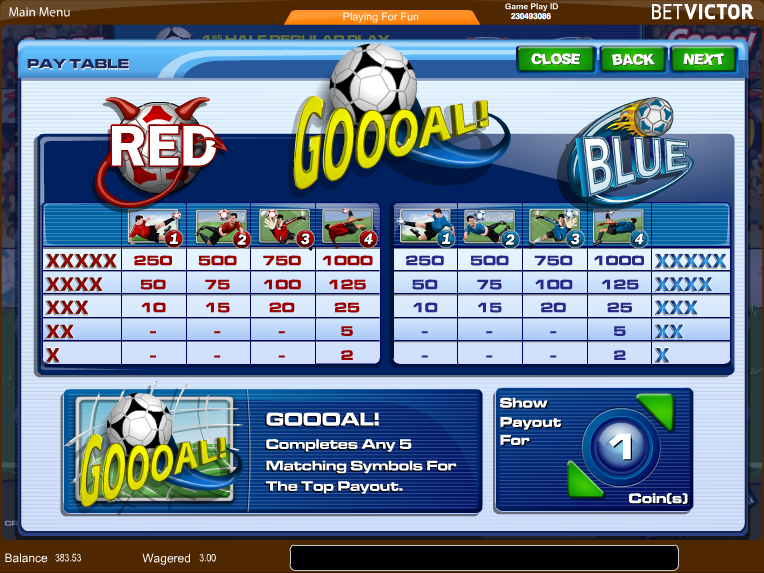 As you can see from the video above, you will now be taken to a screen displaying a number of balls and a goal; just click each ball in the hope that it goes into the net to increase your prize. If your team wins the rewards will be greater. When you hit the ‘Match Over’ whistle, the round finishes and your prize is totalled. This is certainly something a little different and it’s quite addictive. That’s possibly down to the fact that you know you will trigger the bonus eventually if you keep on playing. Check it out if you’re after a footy fix.